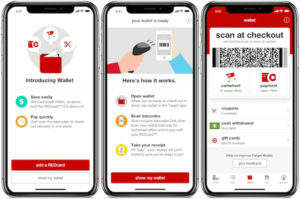 As promised earlier, Target today launched its own mobile payments system with the introduction of “Wallet” in the Target app. Wallet, as the name implies, allows Target shoppers in-store to both check out using their smartphone as well as take advantage of their Cartwheel digital coupons and discounts with only one scan of their barcode. Already, Cartwheel savings in Target’s app had worked like this – that is, after adding the discounts on selected products to your Target account using the Cartwheel feature, shoppers could present a barcode to be scanned at the point-of-sale to take advantage of the savings. The only difference between that and today, is that shoppers can now also choose to pay using their Target REDcard at the same time.